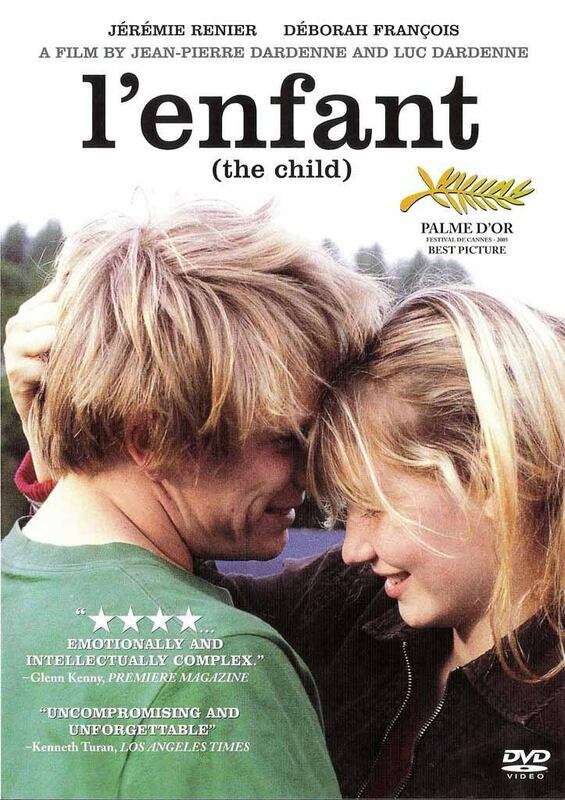 The Dardenne Brothers’ L’enfant (“The Child”) is a hard-hitting, raw and merciless drama, a classic example of contemporary “social realism” film making. It’s a tight and perfectly-paced story, not overloaded with characters – which keeps it moving all the time but also gives the main protagonists room to breathe (even if their onscreen lives are seldom allowed such luxury). It’s rare and very difficult to achieve such a good balance between observing people in the simple, casual moments that constitute the majority of our lives; observing them in the moments when they are making life-defining moral choices; and “the meat” of the script – people going about the fulfillment of their goals, through pure physical actions. The film succeeds by not being about simple things, but going about conveying them in a very simple way. The main characters are Bruno and Sonia – two young Belgian outcasts who’ve just had a baby. Bruno provides for the young family through an assortment of petty crimes, committed by the juvenile gang he’s the leader of. A recurring motif throughout the film is Bruno getting hold of various objects and then trying to resell them at a profit (the concept of profit in his world is usually characterized by the circumstances of the last hour of his life or so). So this in a way defines his goal – making it through today by providing the next meal for himself and Sonia, and finding a place to spend the night, be it a dilapidated hole under the motorway, a homeless people shelter, or, when the money permits – even a rented dodgy apartment. He has no ambition of getting a regular job and changing his way of life, and the appearance of his newborn son does not change this even slightly. As he is left alone with the baby for the first time, and makes another off-the-cuff decision, he is suddenly faced with his main conflict: Sonia takes a moral (or instinctual) stance he doesn’t understand. It was at that moment that I felt the title of the film refers as much to Bruno as it does to his newborn son. Bruno is the child. Deprived of the social circumstances that help a child gradually form into an adult, he has managed to survive only by relying on instincts, by staying a child. Suddenly now, life requires him to behave like an adult, and make an adult’s choices – and he’s immediately lost. The brilliance of the direction and acting (by Jeremie Renier) is that at no time do we hate Bruno for the choices he makes. We understand them, as unspeakable as they are, because we understand the character who is making them. I found it very interesting that, in the end, Bruno is saved and finds redemption because he sticks to the only moral code he knows and respects – the code of loyalty to his gang. And more to the point, to a fellow delinquent criminal, whom Bruno cannot allow to get punished instead of himself. Making this particular choice (and how conscious is it? that’s also a very interesting point), Bruno finally cuts through his Gordian knot – getting off the street, escaping his street troubles and the long-term menace from senior criminals, achieving redemption through accepting his punishment, and most importantly, finding a way back to Sonia (as well as, from a filmmaker’s point of view – resolving the central question). As cheesy and set-up as this sounds, it’s nothing like it – it’s painful and real and stirring to observe. It’s easy to define the film’s central theme as something along the lines of “how society’s inability to support the individual comes back to hurt society”, or “how lack of education and a family structure turns man into an animal.” To me, it was about the impossibility to define morality. What would be considered moral and righteous and soul-saving by you or me or a greater part of a particular society might be morally useless – or even detrimental – to somebody else. What is important is to have a moral system at all, however flawed it might appear to other people. In the end, after all, it will give you your best chance to define yourself as a human being and not an animal.